This tutorial provides a brief introduction to the Java API load testing module of the AppPerfect Load Test using a set of hands-on practice exercises. 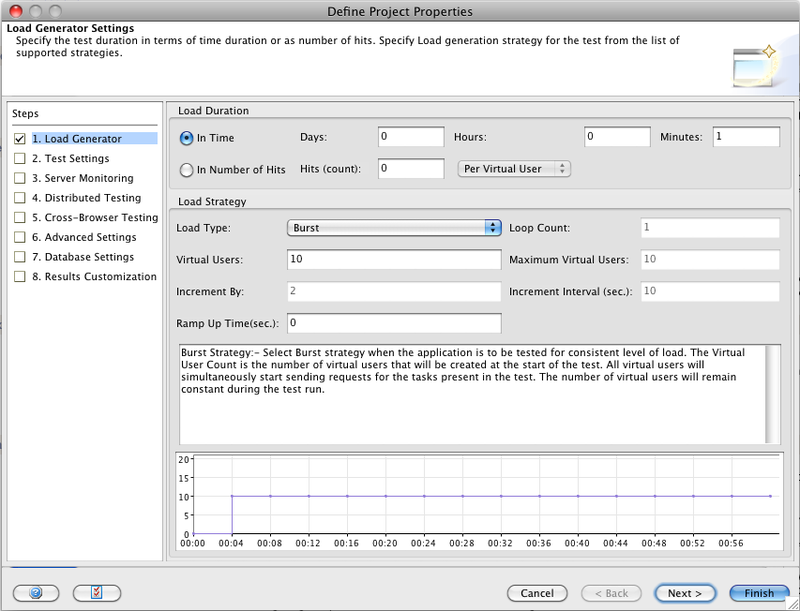 This tutorial assumes you have successfully downloaded and installed AppPerfect Load Test on your machine with the default options. Apart from this pre-requisite, this tutorial is self-contained. Instructions given below are Linux-specific. Within each section, multiple exercises are listed. Each exercise forms a logical unit, which is expected to take no more than a few minutes to perform. All exercises assume you have installed the product in /AppPerfect/LoadTest folder and will be referred as LOADTEST_HOME henceforth in tutorial. If you have installed the product in some other folder, modify the instructions below appropriately. NB: Please follow the steps provided in the "Creating Common Project" section to first create a project, then proceed further. 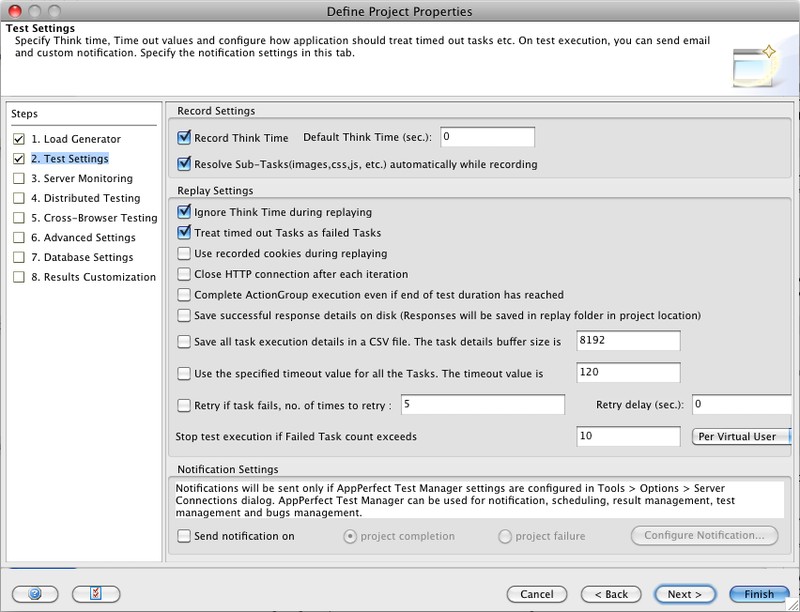 Select the checkbox "Complete Action Group execution even if end of test duration has reached". In the Editor tab, select the NewProject node. On the RHS-bottom, Change the execution behavior to Starting Group (Once at Start), Action Group(s) (Repeat for test duration), Ending Group (Once at End). We have configured to run the test that Staring Group will be executed only once at the start, then Action Group will be executed till the end of the test duration and then in the end Ending Group will be executed once. Select Tools > Options. Options dialog will come up. Select Custom Script Settings tab. 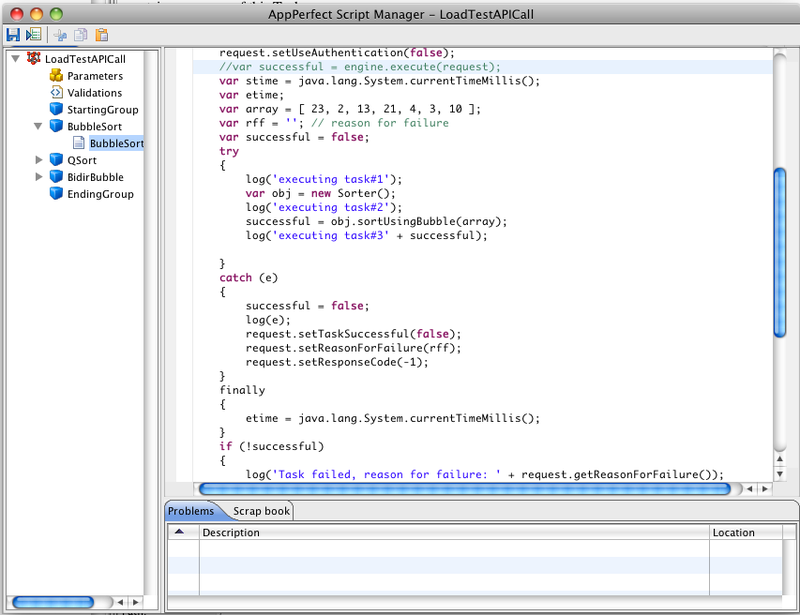 Add the path of the jar file, which contains the classes whose APIs, will be called in the script. 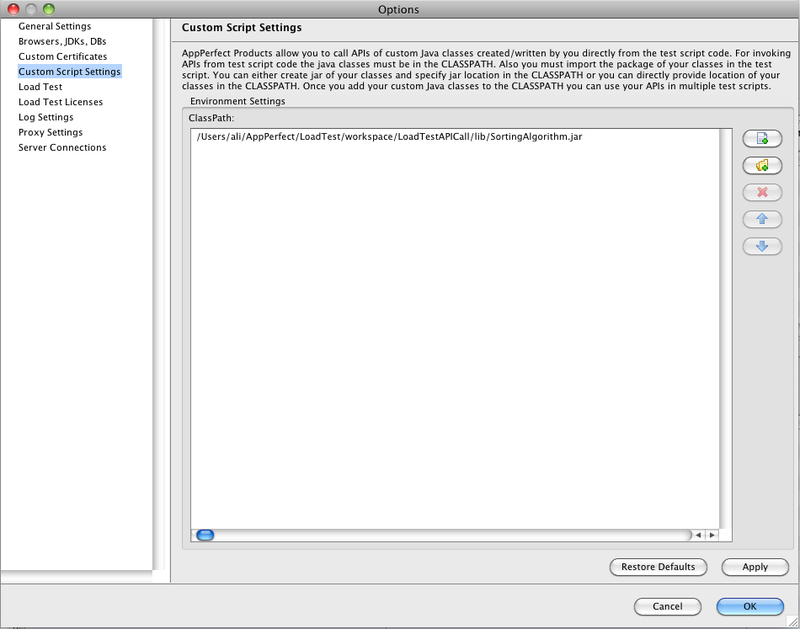 For this tutorial add SortingAlgorithm.jar to the classpath. It have classes com.appperfect.util.BidirBubbleSortAlgorithm, com.appperfect.util.BubbleSortAlgorithm, com.appperfect.util.QSortAlgorithm with a method sort(). We will be creating task for this Java API to Load Test. Select ActionGroup1 and rename it to BubbleSort by changing value of Group Name in Right Hand Side tab. Right click on Project node. This will bring a dialog to add group details manually. Right Click on Group Node. This will bring a dialog to add a task manually. Right click on Task node. This will open script editor with script function of selected task. Add a new task name as BubbleSort in BubbleSort Group by following point no 3. Specify timeout as 30 secs and Response code as 200. Add below script in this task by following point no 4. In Script Editor tree, expand BubbleSort Group and select BubbleSort[/] task. We will see the script of the task that we added manually on the RHS. Save the Test and Run the test. Open LOADTEST_HOME\logs\script_log.txt file to check the messages getting logged in it. Once the test is complete, you will see the results of each task. 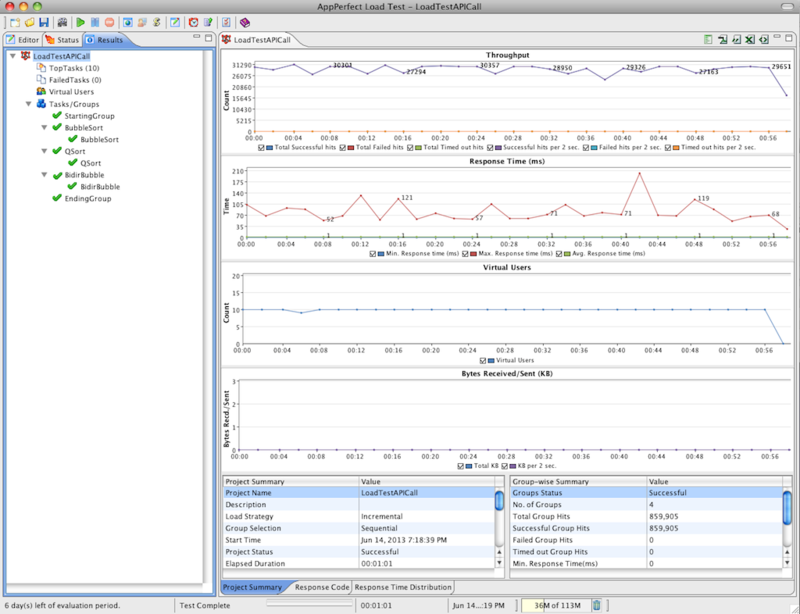 Response times are those of the API calls.